Well, see, there it's official. Now truthfully, I don't know my Tupac from my Biggie but I guessed and got it right anyway - and being able to guess correctly is a mark of superior Mensa like intelligence, right? 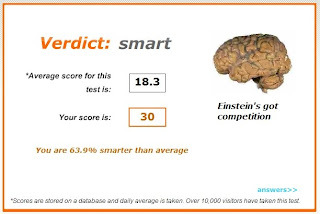 According to this highly scientific test, I'm approximately 64% smarter than the average - or - roughly 200,000,000% smarter than the standard issue LHC conspiracy theorist. Well, I think the operative term is that you have merely Mensa like intelligence...not the real live tested kind. Clearly, sir, you are inferior. And boy am I stoopid. Only 22 right for a score of 20.9% smarter than most. Humph. I only got 26. And why the hell is a rap song on an IQ test? Also, I lack reading comprehension. Humph. Clearly, sir, you are inferior. Yeah, but at least I know how to install a stupid stove by myself. Nyah, nyah. He has you there Nathan. And it's a knowledge test, not an intelligence test. The fact that I figured that out makes me the smartest of all. I scored a 23...and what does Rap music got to do with being smart? What does it mean, LHC Conspiracy? Large Hadron Collider: big science device for making homegrown non-rotating, stationary, non-evaporating, microscopic black holes that will someday destroy the Earth because scientists are evil and they want to kill everybody including themselves just to prove they can and I am apparently a member of said conspiracy to destroy the Earth by suppressing THE TRUTH through my efforts on behalf of the Uniformed (or otherwise) Counter-Intelligence Force (UCF).